The fourth day after new moon and fourth day after full moon in the Hindu calendar is observed as Chaturthi and is dedicated to Lord Ganesha. Most people must be aware of only the Ganesh Chaturti festival that takes place in the month of Bhadrapada (August-September). 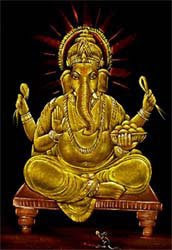 But there are two Chaturthis in a month – Sankashti and Vinayaki – and staunch Ganesha devotees observe a fast on the Chaturthi after full moon and this is considered very important. The monthly Chaturti day which falls after full moon in which a fast (fasting) is observed is known as Sankashti Chaturthi. The fast ends on the day after moonrise. Special Ganesh pujas are done in the evening. The monthly Chaturthi after Amavasi or new moon is known as Vinayaki Chaturthi. When Sankashti Chaturthi falls on Tuesday, it is known as Angaraki Chatutrhi and it is considered highly auspicious. The benefits of Chaturthi fasting include material progress, happiness and fulfillment of desires. The importance of Chaturthi vrat was explained by Lord Krishna to Yudhishtira, the eldest of the Pandavas. It is also mentioned in the Narasimha Purana and Bhavishaya Purana. How to observe Sankashti Chaturthi Puja?